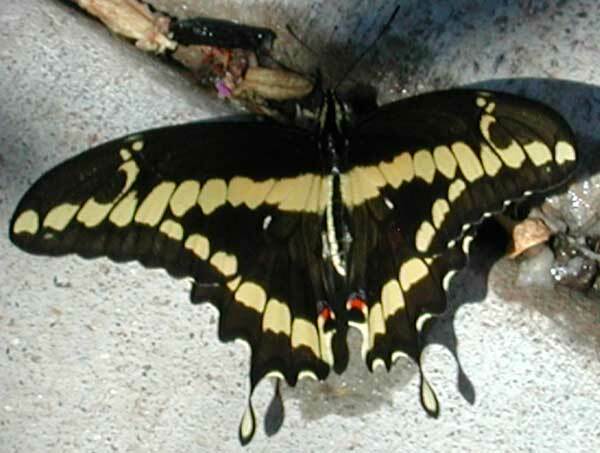 Giant Swallowtails are common in the cities of the Sonoran Desert because the favored host plant is citrus. They feed as caterpillars on the leaves and the butterflies are frequent visitors to lantana and Bird of Paradise flowers. The butterflies emerge in the spring and can be seen on the wing through the summer. Without cities and the orchards of oranges and lemons Giant Swallowtails would be scarce in the Sonoran Desert. In moist canyons this butterfly is sometimes encountered. There the caterpillars use Hop Tree (Ptelea trifoliata) which is also a member of the citrus family.